Opp. Kankaria Lake Front Gate no. 3, Maninagar, Ahmedabad. Call: 70023 36957 / 7016308867. 2018-11-03 15:00:00 2018-11-03 23:00:00 Asia/Kolkata 1st Ever Nightcrawlers Concert | Book your tickets now! 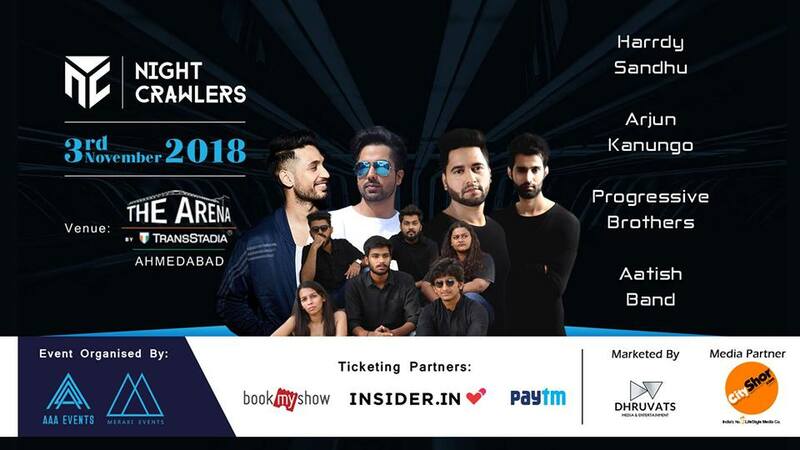 The top Music Sensations of recent times- Arjun Kanungo, Harrdy Sandhu, Aatish band, Progressive Brothers are coming together for the first time ever LIVE IN CONCERT in Ahmedabad! It is the first NIGHTCRAWLERS CONCERT brought to us by AAA Events & Meraki Events. Limited Tickets available! BOOK NOW!